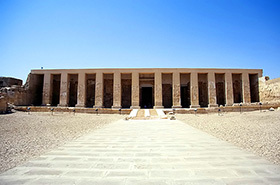 The Temple of Seti in Abydos (300 miles south of Cairo) was constructed by Seti I and his son, Rameses II. Seti was a pharaoh of Egypt in the Nineteenth Dynasty, ruling from 1290-1279 BCE. Seti not only opened mines and rebuilt damaged temples, he also continued the construction on the hypostyle hall of Karnak. Ramses II was the third pharaoh of the Nineteenth Dynasty and had the second longest reign in Egypt, ruling from 1279-1213 BCE. It is largely believed Seti built the temple itself, while Ramses completed the decorations, the surrounding courtyards, and other works. The sacred city of Abydos was the site of many ancient temples and was the burial place for the first kings of a unified Egypt. Nearby there was also a predynastic cemetery with hundreds of graves. The “L” shaped Temple of Seti had a terrace, multiple courts and chambers, two pylons, as well as seven chapels. The temple is made of white limestone and each chapel is roofed with flat corbelling slabs decorated with royal cartouches and stars. These chapels were dedicated to Seti I, Osiris, Isis, Ptah-Sokar, Nefertem, Ra-Horakhty, Amun, and Horus. Each chapel was decorated with prayers to each specific deity. For example, the Horus shrine had a falcon carrying the eternal symbol, the shen, painted on the walls. It is said that Seti’s stone reliefs are some of the finest and most detailed in any Egyptian temple found. A few notable images in the temple are Seti before Osiris as he pours libations to the deities and the image of Ramses and Seti roping a bull. In a hallway in the temple there is an inscription on the wall known as the Abydos King List. This list names the most important pharaohs, according to Seti. There are a total of 76 pharaohs on the list. It omits the names of many earlier pharaohs who were apparently considered illegitimate by Seti, such as Hatshepsut, Akhnaton, Smenkhkare, Tutankhamun, and Ay. The list is a very important reference for historians. The list starts with Menes (probably the same person as Narmer) and ends with Seti. Menes was the founder of the First Dynasty and ruled until his death sometime around 3000 BCE. Seti ruled during the New Kingdom until his death in 1279 BCE. The list therefore records over 1,600 years of history, although with some omissions. This King List is one of only ten found in Egypt. Connected to Seti’s Temple is the Osirion, an enigmatic underground chamber connected to the Nile, fashioned from enormous blocks of stone. Its date of construction and purpose are still under investigation.